Flu season is in full swing! Every year, millions of Americans fall ill with seasonal influenza – more commonly known as the flu. As we enter the peak of flu season, we’re debunking seven common myths about seasonal influenza and the flu vaccine that have been running rampant online – spreading almost as fast as the virus itself. Myth #1: A common cold can “morph” into the flu. Fact: The common cold and flu are caused by different viruses, which means that one cannot “morph” into the other. If a member of your family comes down with the flu, it was caused by a flu virus, not a cold virus. The challenge is that the two illnesses have overlapping symptoms, making it difficult for moms to determine whether it’s the flu or just a common cold. 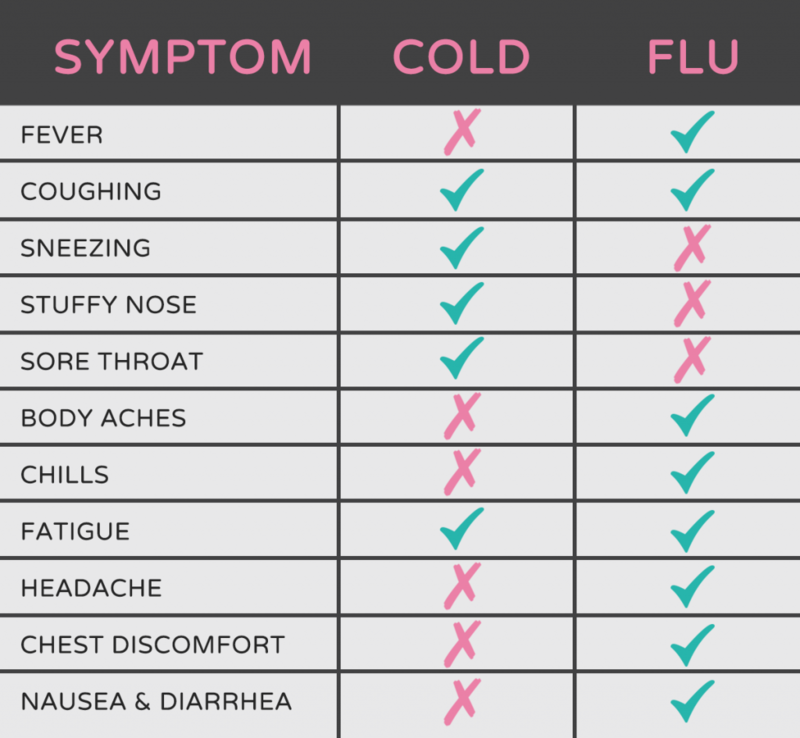 Refer to the following chart to help you decide which virus you’re dealing with. Myth #2: The “stomach flu” is related to the seasonal flu. Fact: Norovirus, commonly referred to as the “stomach flu,” has no connection to seasonal influenza. Norovirus is an intestinal illness, while seasonal influenza is a respiratory illness. Vomiting, diarrhea, and nausea can be associated with the flu — but keep in mind that these are not primary symptoms of flu. Myth #3: If I don’t have any symptoms, I’m not contagious. Fact: Most healthy adults are contagious beginning one day before symptoms develop and lasting until about a week after they’re sick with the flu. This may last even longer in children and people with weakened immune systems. Since symptoms start 1-4 days after the flu virus enters the body, you may be contagious before you even know you’re sick. The U.S. Centers for Disease Control and Prevention (CDC) recommends that people stay home for at least 24 hours after fever symptoms go away without the use of a fever-reducing medicine. Avoid close contact with other family members, continue to cover your coughs and sneezes, keep your hands away from your face, and wash your hands. Myth #4: The flu vaccine causes the flu. Fact: Made using inactive flu viruses or no flu viruses at all, the flu vaccine cannot cause seasonal influenza. Some people report having side effects after receiving the flu vaccine; however, these symptoms are typically mild and last only 1-2 days. Myth #5: The flu vaccine works the same for everyone. Fact: Although the flu vaccine is the single best way to prevent seasonal influenza, protection can vary widely from one person to another. Typically, the flu vaccine works best among healthy adults and older children. 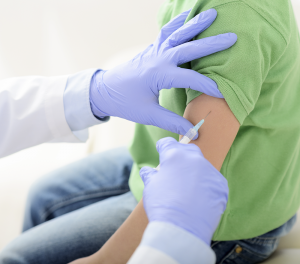 Older adults, younger children, and people with certain chronic illnesses may build less immunity than those who are healthy, but the vaccine will still provide some protection against the flu. Myth #6: The flu vaccine works right away. Fact: After you receive the flu vaccine, it takes your body about two weeks to develop the antibodies needed to defend against the flu. This is why the CDC recommends getting vaccinated early in the fall, before flu season really picks up. Myth #7: If you don’t get the flu vaccine by January, it’s too late. Fact: As long as flu viruses are circulating, the vaccine is effective. While flu season typically peaks between December and March, it can also occur as late as May. If you haven’t done so already, now’s the right time to get you and your family vaccinated! In addition to getting the flu vaccine, moms can help keep their families healthy during flu season by teaching good hygiene habits that prevent the spread of germs. Here are seven tips that experts recommend to help prevent flu. Stay home if you’re sick. 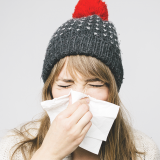 Cover your mouth and nose when you sneeze or cough. Clean and disinfect frequently touched surfaces at home, work, and school. Get plenty of rest, stay active, drink fluids, and eat healthy foods. 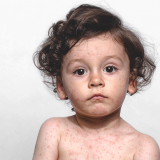 What Does Measles Look Like and How Does It Spread?